When they announced The Five Chef Societe dinner and I was invited to cover the event, I was excited for what was sure to be a great night of food and beer. Little did I know at the time that my enthusiasm was actually an understatement of what an excellent event would unfold on Monday, November 5th. I arrived early and was initially impressed with the way the Handlery Hotel decorated their restaurant for the event. The entire area had the feel of the Societe tasting room – growlers, kegs and barley used in a tasteful way to emphasize this was a San Diego Beer Week happening. The night started with a nice reception as David Maldonado played flamenco guitar and everyone got a chance to sample some of Societe’s fine craft beers. On a side note, if you haven’t heard of or visited Societe Brewing, you’re missing one of the best newcomers to the amazing San Diego beer scene. Open just 6 months they are already very entrenched into the scene and I personally can’t wait until we get to sample the first of the barrel aged sour beers they are making. The first course was prepared by Anthony Sinsay of Burlap and was labeled Uni and Pork Bo Ssam. I found the dish to be wonderfully balanced and paired well with the Harlot, a nice crisp Belgian. 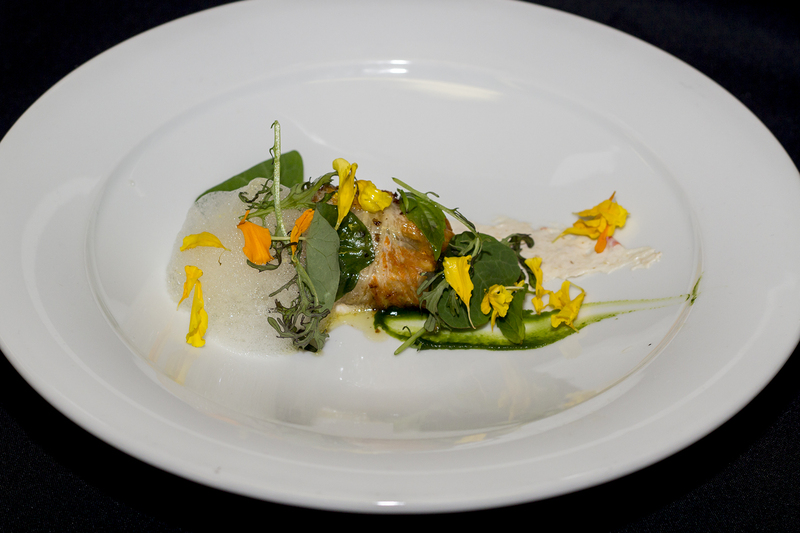 The flower petals really gave the plating a nice pop and the crowd seemed very happy. Later in the night several people stated this was their favorite dish. Being inside the kitchen during an event like this can be stressful, but that just wasn’t the case for this evening. 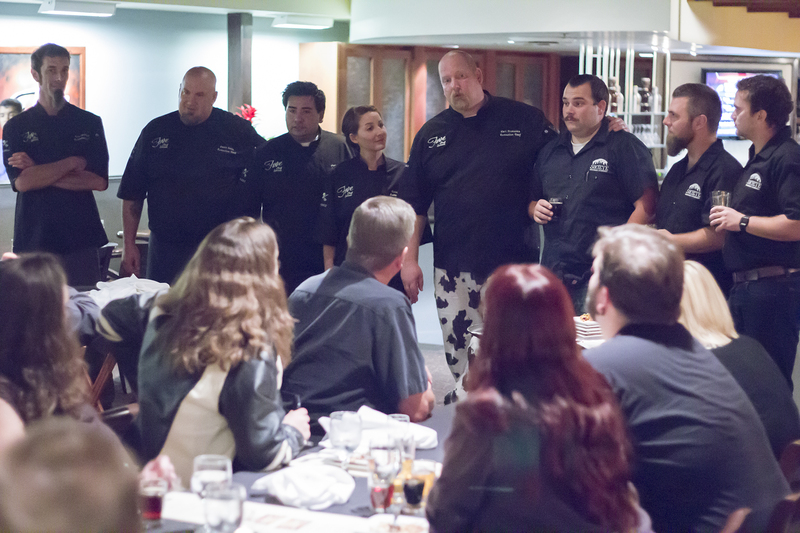 All five chefs were helping each other prepare each plate; the atmosphere was positive and fun. These chefs are at the top of their game and it showed; their preparation was thorough and everything flowed as smoothly as I’ve ever seen. The second course was led by Eric Sarkisian from Tom Ham’s Lighthouse and was called Tongue in Cheek. This was a delicious meatball made from beef tongue and pork cheek on top of a savory bread pudding. I really enjoyed this dish personally and was stoked there was extra so I could scarf down two. It was paired with the Debutante, which washed it down nicely. Coming third and prepared by the Handlery’s executive chef, Karl Prohaska, was an amazing Duck Cassoulet with a reduction sauce made with the Dandy (a refreshing IPA). This dish was cooked perfectly, was beautiful to look at and photograph, and was even better tasting. Karl is not only the brains behind this and all other beer related events at the Handlery, but he is also one hell of chef. Following that dish would probably be difficult for some chefs but Hanis Cavin from Carnitas’ Snack Shack was up to the task. A hazel nut crusted venison was paired with the Butcher, Societe’s deep porter. The richness of the venison and the sauce stood up to the strong flavorful beer and was an impressive pairing. To close out the night Kaitlin Jaime of Pub Cakes made a delicious dessert that was paired with the heaviest Belgian Societe makes, the Widow. Three beignets on top of a creamy smear dipped in a chocolate were the perfect way to close out the night. I had way more than my share. The evening was a tremendous success inside and outside the kitchen. Everyone I talked to had a great time, I’m sure no one left feeling anything less than satiated. The guys from Societe and all the chefs were clearly pleased with the outcome. I have said this before and I’m sure I’ll repeat myself – the Handlery Hotel puts on the best beer events in San Diego. They are committed to excellence in the kitchen, have exciting quality guest chefs and really know how to put it all together into an event to be proud of. I am hopeful this becomes a Beer Week tradition, it was definitely my favorite event out of the almost 500 that were scheduled this year. If they repeat this dinner, or anything similar, you owe it to yourself to attend. P.S. They just announced the date for the fourth Mission Valley Craft Beer and Food Festival. This event puts every other beer festival I have ever attended to shame. Lock in March 24th, 2013 on your calendar right now and get hyped for 20 chefs and 30 breweries showing you what they’re made of! Some of the pictures of the food looks so amazing I want to eat the pictures. Thanks Kate, it was a super fun night!